The heart, the hub, the center of the home is the kitchen. Always has been and likely always will be. It’s most often the first room we go to when coming home and the last room we leave when leaving. 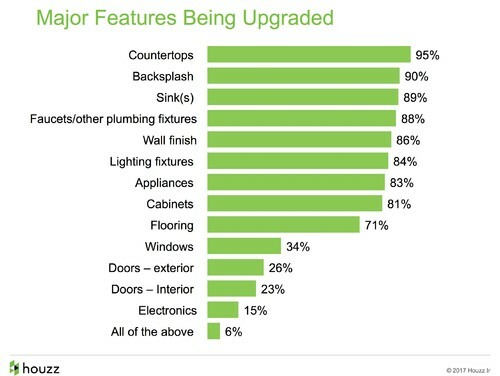 So it makes sense that the kitchen is the first and most often room we renovate when we choose to renovate. The U.S. Houzz Kitchen Trends Study for 2017, spearheaded by Nina Sitchinava, chief economist for Houzz, looks at elements and choices Americans are making for their kitchen renovations. Neighborhood/location specifics tend to drive general style choices with rural dwellers tending to lean towards farmhouse options, suburbanites leaning to traditional and/or transitional alternatives, and urban dwellers choosing more contemporary looks. I have found that all renovators regardless of where they live consider and choose quality over price and their project budgets reflect that quality. 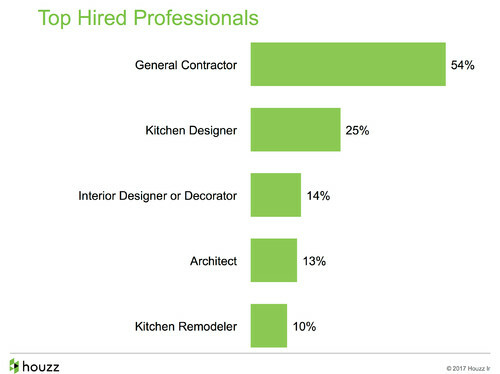 Average renovation budgets range between $25,000 - $50,000. Most renovators (88%), even do-it-yourselfers, hire at least one professional - usually a general contractor - to implement the project. Opening up the kitchen to other rooms in the house and/or to the outdoors is a common motivation. Opening up the visuals as well as the efficiency within the kitchen are also common. Most people focus on the specifics of countertops, backsplashes and sinks for the visuals and organizational storage for the efficiency. 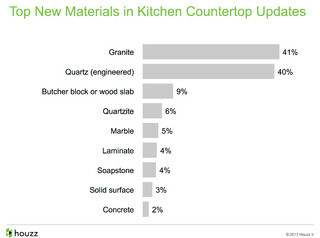 Granite and engineered quartz are tied for countertop updates; multi-colored tile and white tile for backsplash updates. Though still used by a small percentage of renovators, watch for marble to rise; in whole or in accent splashes, for kitchen focal points. 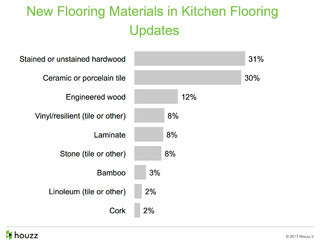 White wins for cabinet and wall color; hardwood, both medium and light, wins for flooring though ceramic and porcelain tile flooring come in a close second. 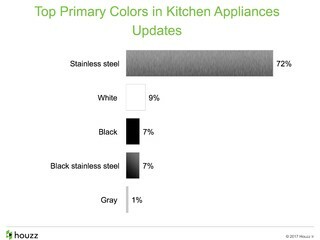 Stainless steel is the clear majority at 72% in appliance finishes. 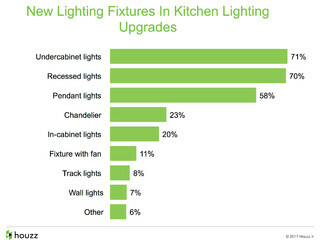 Undercabinet, recessed and pendant lighting are the top lighting choices. Organization and efficiency in the kitchen are important kitchen priorities. Custom built-in and semi-custom built-in cabinets are extremely popular as are pantry cabinets and kitchen islands. 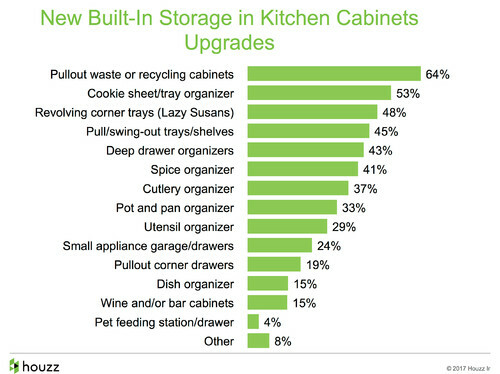 The most sought after functions within cabinets are those for waste/recycling, cookie sheet or tray organizers, and revolving or lazy susan corner cabinets. 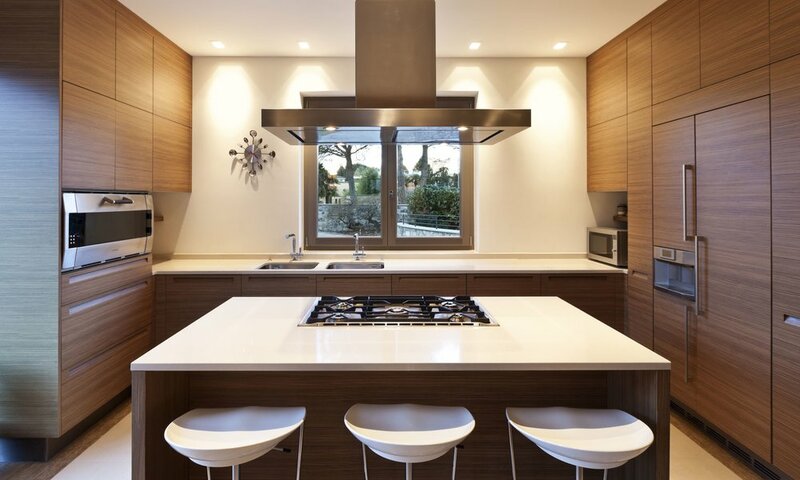 Payoffs resulting from kitchen renovation projects reportedly include increased family time, home cooking, home entertaining, and working at home. 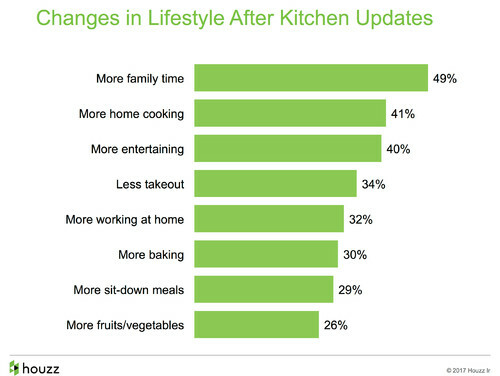 In fact, 75% of the study participants report that they now, after the kitchen renovations were completed, cook five meals per week at home, not including breakfast. The biggest loser, take-out food.